I couldn't help putting up a post of a dress my friend Rachel designed. The combination of coppery and gold tones is incredible. I love her outfit. One of the parasol collection was designed for her outfit. 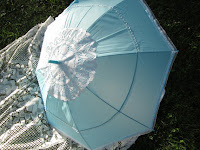 The result was a surprise to me, as I had only her brief description to go on when making the parasol. More pictures to come in "The Dresses:Live." "Today was a luscious afternoon. Nanny served tea in the Parlor for the Ladies' Society. Naturally, I served. Of all the ladies, Mrs. Winston's dress was the most extravagant. Today's chatter was again of the typical idleness, who was seen with who and the activity on Queen's street. This city is booming, large enterprises, many immigrants. Silks and Paris fashions are abundant. Perhaps, I see the world through rose-colored glasses, or maybe the pink glow is reflecting off my sash, but I believe ours is a world of wonder and prosperous." The dress we call Fuchsia Dreams mainly consists of donations from Amy. Besides the parasol, this dress was assembled late Friday afternoon. Willow oversaw the last minuet details. We had little sewing to do for this dress. The blouse and sash were contributions from Amy's wardrobe. Two skirts made up the rest. 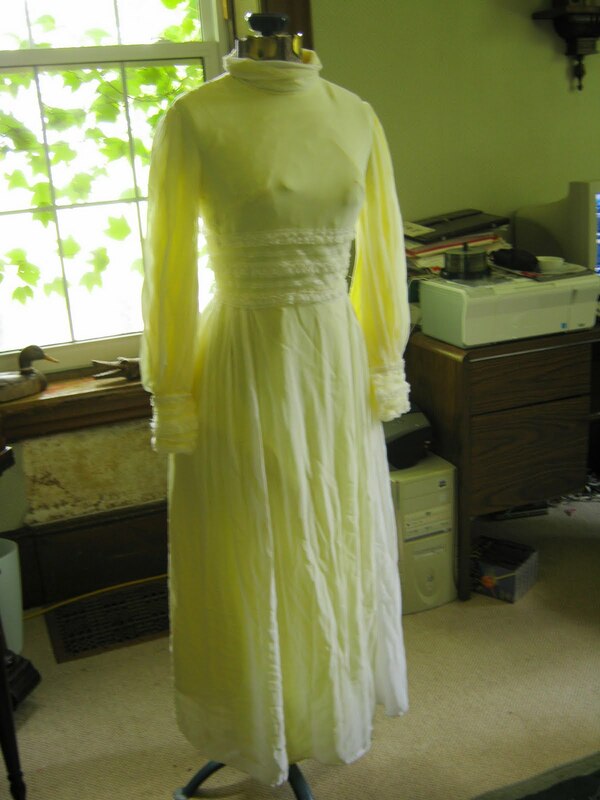 We aimed for an early 1890's era dress. The above pictures are current to 1892, and the reflection of Fuchsia Dreams. I was amazed to find this drawing of a pink and white dress. We didn't trim the hemline in pink, but rather added the little bows for effect. <=click on this picture to enlarge. 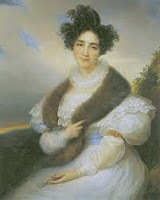 1835 Winter Dress, painting. 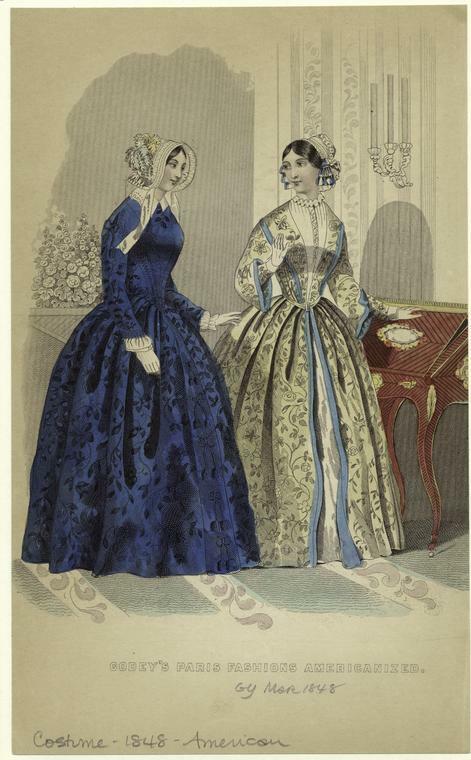 1838 Spring Dresses, catalog. Credit for this dress goes completely and entirely to Willow. She surprised me with this dress upon my return home from work one day. 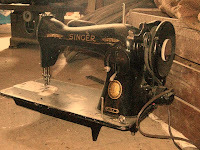 I had left the dress on the Sewing Lady (see before picture). When I returned she had the finished design all pinned on the Sewing Lady, she had designed it to match my yellow evening gloves. 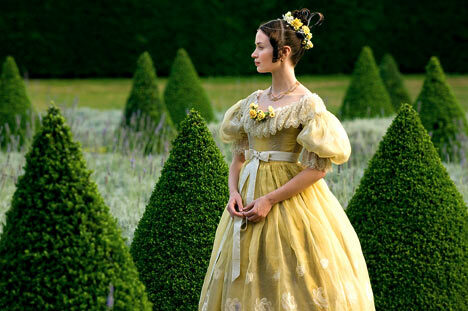 To achieve the yellow puff sleeves, she took out the inner seam, and rolled the sleeves up. She also made a hoop and included an underskirt as well. 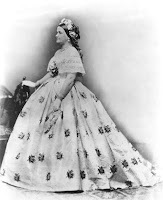 As you can see, the dress falls within the 1835-1838 era. I had limited resources for this early period -- at least picture wise. 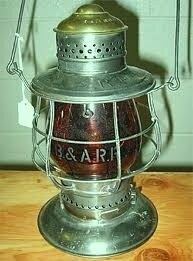 We have dated it 1837 because this is the first official year of the Victorian Period. Many thanks to Auntie Margaret for the gift of her bridesmaid dress! From 1878 to 1848, Last Minute Changes! Early this morning, Koula sent over a large white petticoat. This added a whole new dimension to Willow's dress. She had originally wanted to go white under her over skirt, but had to instead go with black (the largest skirt we had) and draw up the overlay into an 1878 fashion. (see "An Old Fashioned Girl" post). The white petticoat/crinoline is a perfect match. Completed with one of Colleen's antique hats, her dress heads back to 1848. The above picture is from a 1848 Godey's Ladies Catalog (Reference Laura Ingalls books for more on this magazine.) Willow's collar and skirt patterns after the blue dress. More pictures to follow. Many thanks to Koula for this addition! 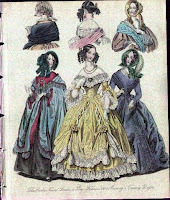 1829 "Going Away Dresses", these dresses would remain in style for a couple of years. By 1836, the latest styles were flouncy and exaggerated. we have included an regency era outfit. Princess Victoria’s rumored ascension in England will signify great change. Such a young queen, barely 18 I have heard. Rumours of her wardrobe are filtering down though the countries; just this past epistle sent over from my sister in Hampshire County confirms new styles are in high demand. Some of these fashions are taking wing on our continent. I’m afraid I’ll be long in joining the latest fashions. Money is scarce these days with the harvest not being what it was or should be. T’will be no new dress for me this harvest. Yesteryear’s fashions will have to do. "Yesterday, Mrs. Adams came in for tea, I over heard her say to Mother "These last events have been emmensly disconcerting." Within a week President McKinley has been asasinated, President Roosevelt is now in office. President McKinely was shot at the Exposition in Buffalo, His last words were "It is God's way; His will be done, not ours." Father had suggested taking me to the exposition, business took preeminence. How despertly disappointed I was when Father changed his mind! Ours is an age of innovention. Perhaps, had we gone to Buffalo, we would have seen the latest automobil, or, perhaps we were best to stay home. Father was saying Mr. Henry Ford is not yet satisfied with his design. Mr.Ford started the Detroit Automobile Company three years ago. Investors paid heavily, Father included. Father says we must not consider this poorly, he is quite convinced that Mr. Ford will succeed. Nonetheless, his tardiness is putting such pressure on our financial state that Father said a new dress for the Sociable was quite "impossible." I cannot have a new dress. clipping. It is not for naught that they say "Necessity is the Mother of invention." Perhaps, I will attain a ride in an automobile at this Sociable!" 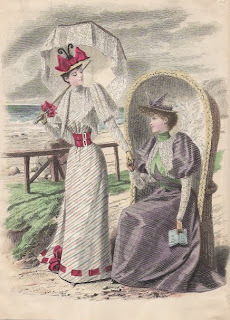 When I first saw the Victorian pictures on Colleen's blog, I was enthralled. These pictures gave me the idea for Kelsey's dress. (I took a snap shot of Colleen's picture, all copyright belongs to her.) When I saw the red dress in the photo-shoot, immediately I envisioned billows of ribbons and lace for the Victorian Festival. The dress so complemented Kelsey that I decided to use the dress for her. The design I imagined was from a small figurine that Willow had on a shelf. 1901. This was an authentic drawing of the dress you could order. 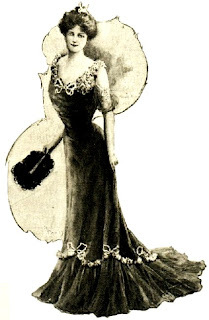 1900 or 1901 era is usually called Turn of Century dress. The dress came together very quickly. We used the hoop mentioned in a previous post, I did have to cut it down a bit to size. Also, amid the ribbons and lace, I have added a row of little burgundy flowers along the hemline of the dress. You can see them here. I did not have to cut or alter the dress in anyway. Parasols provide protection from heat & sun, and preserved the fair Lilly-white complexion. 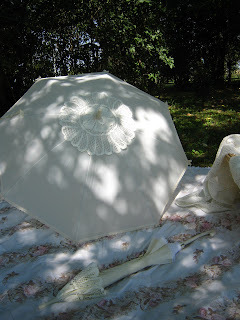 These are some of the parasols that we have made. “Every day, more and more slaves are escaping into Canada. Father says we play a significant role towards abolition of slavery. Tonight, we are to hold a grand party: the railway runs tonight. No one must know. I will wear my new gown. Mother had my dress made in fashion with recent gowns of First Lady, and by first lady I do refer to Mrs. President Lincoln. The design for this dress has been the green picnic dress off the movie, Gone With the Wind. I found it interesting that this particular dress is a combination of two of Mrs. Lincoln's gowns. These gowns were photographed in 1862. The green picnic dress off Gone With the Wind is definitely a classic icon. When Sarah first mentioned this dress as a reference of what she would like to wear to the festival, I was thrilled. I love a challenge and this was a challenge. As mentioned in an earlier article, the first obstacle was the material. Once I had the material figured out (see below article), I took the sleeves off the wedding dress I had bought last year. I also took the high neck out. After many designs, I decided to make a pinafore to go over the wedding dress. I cut the sharpie colored curtain. Two thirds of the curtain made the skirt of the pinafore. The top edge of the curtain (where the rod would slide through) made the ruffle and the rest made the top of the pinafore. From the 1 meter of green cloth, I made an extra long sash. Green ribbons from another 4 for 1 sale added the finishing touches. As you can see, its not exactly the same as the Gone With the Wind dress, but I am excited as to how close it turned out. I had the sunbonnet from another outfit when I was Queen Victoria at the local museum. You can check out my portfolio slideshow to see more on that outfit. We did have to use the 4 leaf clover scarf for the bonnet, nothing else looked right. The 4 leaf clover scarf is a gift from my Grandma from her recent trip to Ireland. The color is perfect! 1867 Michigan, two years after the War Between the States. . .
"I stood in the center of Campus Martius Park surrounded by echoes. The cold November air penetrated through my mourning dress. I had been here two years prior and had listened as Captain George Armstrong Cluster presented an eulogy of our beloved President Lincoln. It were the words of the President which now rang repeatedly through my mind, haunting echoes from the past. "Thank God for Michigan", he had said. Michigan. The 24th Michigan Infantry Regiment, my regiment. I do believe my heart was bitter that day as I stood in the park. My soul was crying. For although four years had past, the grief had not. My soldier was among that fatal 82% of the Michigan 24th. I still dressed in mourning, the latest fashions, naturally. I was proud of my country, my sacrifice was great. In honor, I dressed to the latest fashions and wore the metal of honor -- his metal. My soldier's honor." Initially, I designed this dress from head knowledge of the era. However, I recently found this picture of an authentic post -civial war mourning dress displayed in a museum. This dress is 1867 circa and remarkably like our design. We call the following outfit: A Tragic Romance. As you can see from the pictures, the main difference between the original and the copy is the neckline. The neckline is in keeping with the era, although this style of neckline tends more towards evening wear. 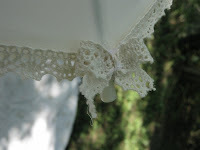 The dress has a double layer of lace ruffles on the skirt, and is adorned with a choker necklace cameo. A gilded fan and embroidered purse complete the outfit. A Tragic Romance will be worn by Colleen this Victorian Festival. An authentic replica of the civil war metal will accompany the outfit. Outdoor photo credits to Willow. Below are pictures of Colleen's underskirt, as you will read in the next post, her outfit has a double layer of lace surround the bottom of the skirt. 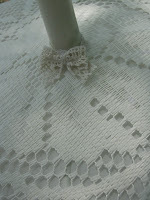 Lace tends to be so heavy that it usually needs hoops to extent the material out from among the ankles, or simply carry the weight. Kelsey's dress will also have lace at the bottom of it, I bought 3 meters of lace for $2 a meter, to hem the bottom of the red dress. turn our backs, leaving reams of sewing pins across the floor. Glue sticks melt and ribbons tangle, but things are working nicely, no hair elastics this year--well, at least not yet.